After a lot of emails about slot books I've made another one and taken photos in an attempt to describe the process. 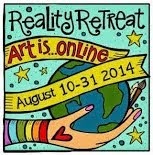 Thanks to Wendy who emailed me the information in Alisa Golden's book. It was interesting to see that although the principle is the same, my book has a different slot and tag system. My original book is small and is made of 110 gsm paper which gives it a nice firmness. This one is larger and made of 80 gsm photocopy paper and is rather sloppy. Okay for a trial but not very impressive. I used 20 sheets of A4 long grain copy paper which gave me 80 folios. Fold in half and slit. Fold in half again and slit. Then fold in half and crease with folder. Stack the folios and press. Mark spines in pencil into thirds. Divide into two eq ual stacks. 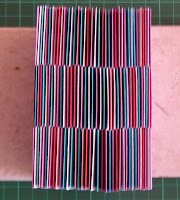 Stack 1: Cut a 1mm slot into the centre of each fold. These are slot folios. 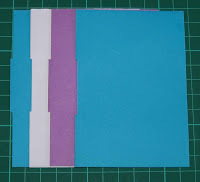 Stack 2: Cut a 1mm slice from the third above and below the centre third. These are tab folios. Alternate slot and tab folios and stack. Open the f irst slot folio (in this case purple). Take the first tab folio (pink) and gently roll from the head to the tail of the right hand side. Slide this roll (pink) through the slot of the first page from the inside. 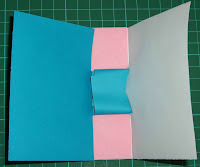 Then slide the same roll (pink) through the second slot folio (white) from the outside. Open up the roll and it becomes a new page (pink). Take the next tab folio (blue), roll and slide through the inside of the (white) folio and then straight into the outside of the next slot folio. Continue in this way until all tabs and slots are assembled. The spine looks quite pretty and you can make whatever cover you think would suit. I haven't covered this one yet. I hope this description makes sense. It's very fiddly and the pages that get rolled look a bit sad when unrolled. I'd be pleased if this just gave you some ideas, which is what it has done for me. I'll be trying Alisa's version sometime soon. Thanks to everyone who emailed with thoughts, opinions and questions about slot books. You gave me a lot to think about. The colours look lovely Carol. So yours doesn't have the little pockets that mine has? I covered a piece of book board in the paper the same as the book & glued one in each of the front & back pocket and then it was made. My first one was text weight paper and looked a bit sad after being rolled. The next one I made was more fibrous paper and that just sprung back - Double sided too, so it looks good in that sense. I have just posted my version on my blog [http://cheshirecheese.blogspot.com/] it is basically the same method but yours shows far greater expertise! I hadn't noticed the look of the spine until you mentioned it - definitly a book that should always be made multicoloured. Thanks for the idea. I love your baby book as well - did you print the photos on the paper or add them after you had made the book? Regarding Celia's question about the tiny book of baby photos, sometimes I print out rows of tiny pictures in landscape which makes them just the right length for a little book. Otherwise I may cut them out and attach with double sided tape or glue stick. Same with the fish books. I think they look better if printed directly but it limits the size of the book unless I join the strips. Thanks for your answer about the baby books - I think I will have a go when I have some time. I know a rather cute baby who really deserves a little book! Wow........that's a lot of work, but the outcome seems well worth it. Very cool book! I would love to try my hand at making one myself.